Many veterinary clients have a limited understanding and perception of what a disease in their pet actually entails. Typically, clients assume that a “disease” is caused by an infection (bacterial or viral), a malignancy, or physical trauma. With these assumptions are the ideas that infections can be cleared, malignancies resected or killed, and traumas repaired. However, and immune-mediated or imflammatory ocular disease lacking a specific etiology, and possibly requiring continuous management, is a more difficult for most clients to conceptualize. Unfortunately, many chronic degenerative and inflammatory ocular diseases are immune-mediated or associated with hypersensitivity. Inflammatory ocular diseases include episcleritis (Figure 1), scleritis, uveitis, chronic superficial keratitis, keratoconjunctivitis sicca, meibomianitis, follicular conjunctivitis, uveodermatologic syndrome, lens-induced uveitis, optic neuritis, eosinophilic keratitis, equine immune-mediated keratitis, equine conjunctival pseudotumors, masticatory muscle myositis, and extraocular muscle myositis. This is not an exhaustive list, and there are many other ocular infectious and cancer processes with strong immunologic components that generate a diseased state. In animals, homeostasis of the immune system involves tolerance, immunosuppression, and immunostimulation in response to various antigens. In an immune-mediated disease this delicate balance is upset. Overly immunosuppressed patients may develop susceptibility to infective agents and/or the growth of cancerous cells. Patients failing to tolerate self-antigens may develop autoimmunity. Patients failing to supress responses to common environmental antigens may develop allergies. A state of immunocompetence is considered an optimal balanced immune response. Classically, most physicians assumed that immune-mediated diseases were only the result of hyperstimulation of the immune system. However, newer models suggest immunodeficiencies and/or dysregulation of immune processes are more common etiologies of these diseases. Cures for immune-mediated diseases may then rely upon immunomodulation rather than direct immunosuppression. Many new drugs for the treatment of immune-mediated diseases have been designed with these concepts in mind. Immunomodulating rather than, or in addition to, immunosuppresive drugs may be most efficacious in combating immune-mediated disorders. Many immunomodulating drugs show synergism in combating immune-mediated ocular disorders. Lower prescribed quantities of two or more drugs with disparate immunomodulating mechanisms are less likely to cause complete immunosuppression, or other adverse effects generated by a single high-dose drug. The damage caused by ocular immune-mediated disorders is dependent on their duration and recurrence. Therefore, early accurate diagnoses and quick medical interventions tend to reduce the damage of an immune-mediated disorder. Preventing recurrence is often dependent upon complete remission of the signs of a disorder before the tapering of drug regimen can commence. The rapid tapering of immunomodulating medications has been associated with an increased probability of recurrence of many immune-mediated diseases. This recrudescence often necessitates increased dosages of immunomodulating medications associated with secondary complications or other adversities. Appropriate medical management of immune-mediated disease will therefore involve vigilant monitoring and reevaluation of systemic side effects in addition to any therapeutic effects. The remission of an immune-mediated ocular disease may be measured by slit lamp biomicroscopy, Schirmer tear testing, tonometry, ophthalmoscopy and/or by an evaluation of consecutive photographic medical records. Medical management can be modified following recurrent ocular evaluations to promote favorable visual outcomes. Immunomodulating occular medications are slowly tapered following signs of remission. Tapering schedules are designed to keep the disease in remission, minimize adverse effects, and improve client compliance. Once a diagnosis of an immune-mediated ocular disease has been made, appropriate treatments can reduce the incidence of associated blindness, glaucoma, and other damage of ocular structures. Appropriate immunomodulating and/or immunosuppresive medications designed to combat immune-mediated disorders, and their pharmacokinetics, will be discussed in a subsequent article. If you have any further questions regarding immune-mediated ocular diseases, please feel free to consult with a veterinary ophthalmologist. Figure 1. 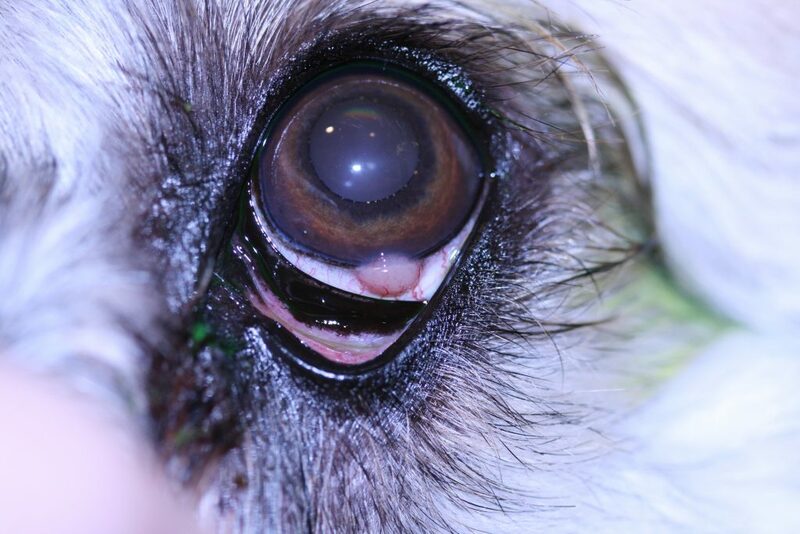 Nodular granular episcleritis (an immune-mediated disease) in the left eye of a 3-year-old male neutered mixed breed dog.